Folks, it’s once again Black History Month—a month that tends to sneak up on me since I’ve been on staff at The Root, where every day is steeped in black past, present and future. But as February 1st approached, so did the uncomfortable feeling that I haven’t been doing my best for the culture; specifically, the culture I otherwise do my best to champion every day. True Confession: Though I write about black-owned beauty products almost daily, and experiment with the latest offerings on the regular (mostly in-store, or in sample form), my daily routine is not even mostly comprised of black-owned products. No, I’m not proud. Why? Mainly out of laziness—you know, you find what works and just stick with it, whether out of fear, lack of time, or lack of energy (you’ve been there, I know). And I work from home, generally wearing no makeup whatsoever. So, new looks are mostly an off-hours concern, if at all. And for those of you who think I must be swimming in swag, that’s unfortunately a half-truth. As a beauty editor, I get a fair amount of product to sample. But surprisingly, only about 30% of it is from black-owned brands. That’s not a complaint. Black-owned startups rarely benefit from the kind of generational wealth, loans or seed funding their white counterparts sometimes garner. And historically, they have a harder time making it onto the shelves of big box retailers—which is why we celebrate each time it does. But while celebration—especially on a public platform—is great, so is financial support. With that in mind, this month, on behalf of the Glow Up, I am embarking on a black beauty only challenge, meaning that for the entire month of February, I will be using only black-owned or black-helmed brands for my skin, face, hair and nails. And with the rare exception of the swag items we’ve been sent or might receive during the month (which I’ll disclose here—bring ‘em on, beauty entrepreneurs! ), we’ll be trying to purchase these items, to be as objective as possible. That’s right: Wash Day? Black-owned beauty. Ash patrol? Black-owned beauty. Night out? Black-owned beauty. Mani-pedi? Black-owned beauty. I’m thinking of it as a welcome blackout on my tried-and-true yet tired assortment of products (that is, all except the black-owned ones). And as anyone who’s ever gone on a fast knows, removing temptation is key. In this case, the timing couldn’t be better, since I’m moving at the end of this month. What better place to start packing than my vanity? And while I won’t be posting every day, I will be keeping you up-to-date on what I buy, where I buy it, how it works/wears, and whether it becomes a long-term replacement for something else I’ve been using. We’re rooting for everybody black, and it’s going to be an adventure—wanna come? C’mon... if you can go vegan with Beyoncé, you can blackout your beauty routine with me. And while I can’t offer you lifetime tickets to, well, anything I’m currently doing, I can promise that you’ll be doing it for the culture. The Glow Up tip: Have you tried some incredible black-owned beauty products you think I should dip into this month? Drop suggestions in the comments (actual consumers only, please). 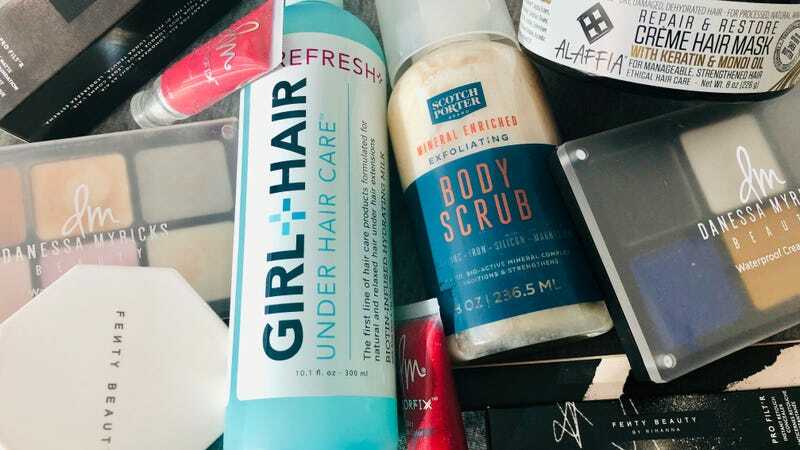 How We Got That Glow: What Were the Glow Up&apos;s Favorite Black-Owned Beauty and Hair Finds of 2018?